Howdy Dooers! :) Hope ya'll are gettin crafty and enjoying a beautiful afternoon! I colored in the little boy's shrt with B06 and YR07 and his pants with E13. The girl's dress was also trimmed with E13 and the green was a combination of BG18 (deepest shadows), BG15, BG13, and BG10. Skin on both kids was done with E000, E00, and E11. Hair for the girl was a combination of E50, E53, E31, E23, and E25, while the boy's hair was E23, E25, and E27. I used the tip-to-tip and lighting source techniques for this image and finished off the background with the air brush system. 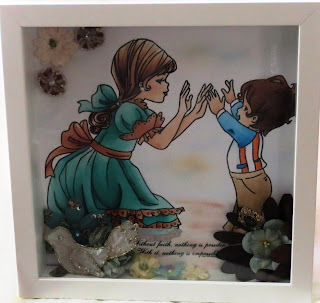 Then I had some embellishing fun and grabbed lots of old prima embellishments that were laying around unused and glued them inside the shadow box to add dimension. LOVE it Adina! Sooo cute - you know me and stamps and markers - I am a little "afraid" of them -but maybe someday I'll cross over to the Copic side - If you keep posting cute things like this - it may be sooner than later! !